The blood of Israelis and Palestinians will be on the hands of our politicians. With the British Parliament due to take up six hours of precious debating time on Monday over whether to recognise a “state of Palestine” Vincent Fean’s article in The Guardian sums of the ignorance of those who will vote for such recognition. And so with British politicians. With May’s general election starting to loom large on the horizon and UKIP continuing to take votes off all the main parties (they have just won their first ever Member of Parliament) many of our Parliamentarians would rather flee to a foreign issue which is certain to win them votes due to the vehemence of many voters where Israel is concerned. Britain operated the Mandate which ended in a 1947 UN vote to partition the land, a vote which was rejected by all Arab leaders. Britain’s responsibility ended then. In fact the only case I know that relates directly to the issue of “illegality” is the recent British Supreme Court case Richardson and another v DPP in which, because it could not be proved that Israeli-owned Ahava’s London shop was selling illegal products, those who occupied the shop forcing it to close down for some three hours were found guilty of aggravated trespass. Therefore, Ahava’s factory on the West Bank is, in fact, legal. As for home demolitions once again they turn on the legalities of each individual case. 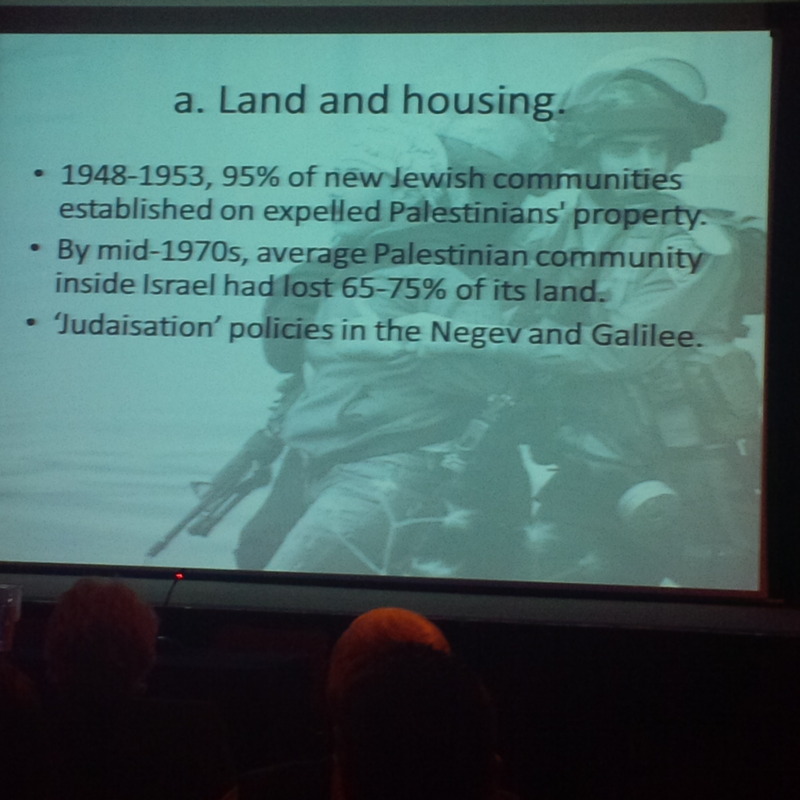 Illegal Jewish homes are also demolished. Really? Fean must have not been near a radio or television for the last three years and so not seen what Assad and Islamic State have been doing to their own people while the US, UN and NATO all watched on. Never again? Don’t believe it. If Monday’s debate ends with a vote in favour of recognising the “state of Palestine” there will be no change on the ground. Israel won’t suddenly give up its security requirements because of our Parliament. That would be suicide. The recognition will only ratchet up the expectation of the Palestinians and lead to more bloodshed and violence on both sides. This blood will be on the hands of the likes of Fean and our politicians who vote in favour on Monday. In a deeply ironic article The Guardian’s George Monbiot asks why, in light of NATO’s current air war against Islamic State, the west doesn’t “bomb the Muslim world – all of it” and possibly “flatten the entire Middle East and West Asia” his thesis being that with there being so many human rights abusers in the region why concentrate solely on Islamic State/ISIS. Monbiot adopts the usual hard-left line of Israel having committed a “massacre” in Gaza during Operation Protective Edge. He is doing the work of Hamas’ propaganda arm for them. 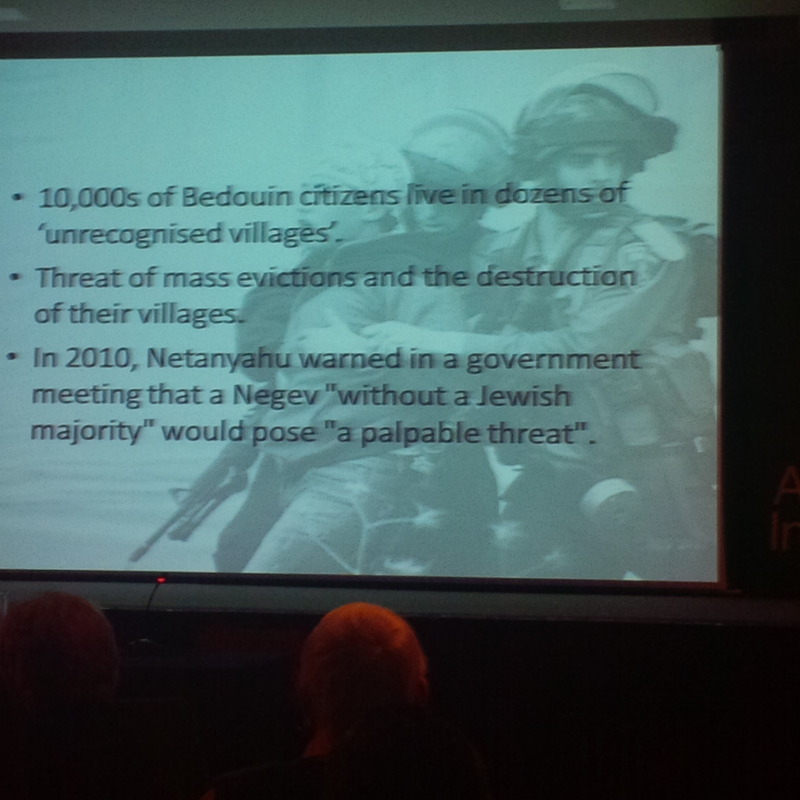 Civilians were the main victims of Operation Protective Edge, as they are in any war. Civilians are already being killed by NATO in Syria. But a significant proportion of those 2,100 dead in Gaza are likely to have been the Hamas fighters who had fired rockets at Israeli citizens from nearby to those schools and hospitals, who had dug attack-tunnels under Israel and who came out of those tunnels with the aim of killing as many Israelis as possible. Monbiot goes on to suggest air attacks against Iran, Saudi Arabia, Pakistan and Shia militias in Iraq due to the horrendous treatment of many citizens in those countries by their governments. By citing Israel alongside such oppressive oppressive regimes Monbiot puts Israel on a par with with some of the worst human rights abusers when in fact Israel is not only the most liberal country in the region but on a par with the west when it comes to, inter alia, freedom of speech, freedom to practice religion and freedom to express one’s sexuality. But Monbiot’s biggest crime in this article is to underplay what is happening to religious minorities at the hands of Islamic State. Monbiot cites individual cases of human rights abuses by the corrupt dictatorships in Iran, Pakistan and Saudi Arabia but is this really on the same level as lining up hundreds of innocent civilians and shooting them in the head before pushing their lifeless bodies into a river or shooting them dead in mass pits, burying them alive or crucifying them like Islamic State terrorists have done to Christians, Yazidis, Shia Muslims and others? No reasonable person could approve of what has been happening on a daily basis in Iran, Saudi Arabia, Pakistan and Iraq. But the regimes that head these countries are not Islamic State. Neither is the west ignorant of these countries and has been attempting “political solutions” that Monbiot calls for in the penultimate paragraph of his piece. A change of leadership was recently forced through in Iraq and short-lived democracy movements sprung up in Iran, Bahrain and Syria. Although the latter were brutally oppressed they are waiting to rise again. Courageous women continue to attempt to demonstrate for more freedoms in Saudi Arabia and Iran. There are no calculations for Islamic State’s brainwashed terrorists to make. Defending, propagating and dying for their extreme interpretation of Islam is their only objective. All obstacles are liquidated. Monbiot fails to fully grasp this. His piece does justice neither to Israel, expected from him, nor to those suffering under the brutality of Islamic State, unexpected from him. What does David Hearst mean by “the folk”? 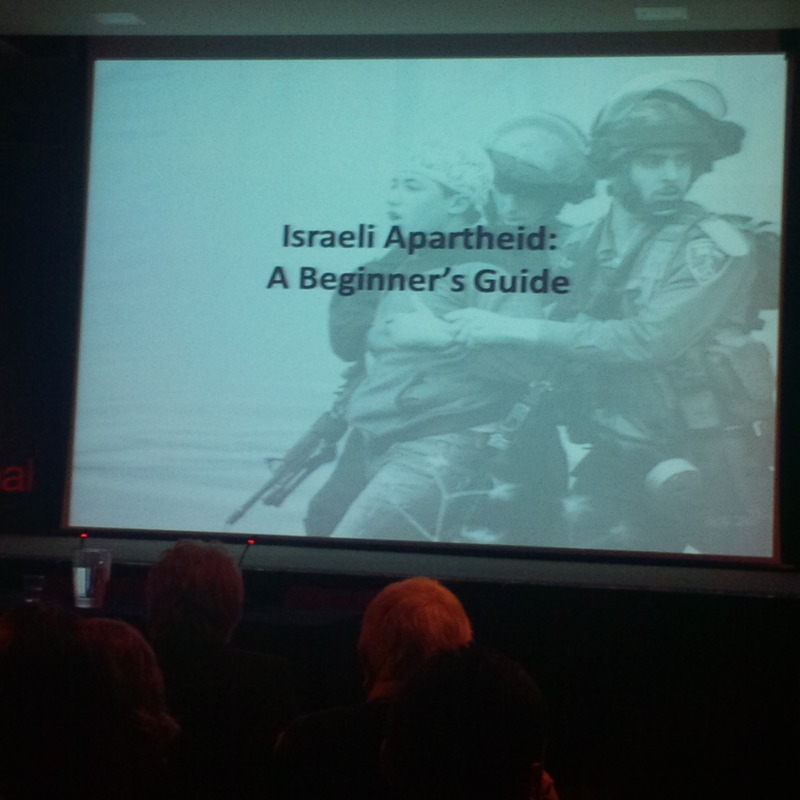 On Friday night I went to Amnesty’s London HQ to hear Ben White publicise his updated book Israeli Apartheid: A Beginner’s Guide. The event was chaired by journalist David Hearst, former chief foreign leader writer of The Guardian. What does Hearst mean by “the folk”? 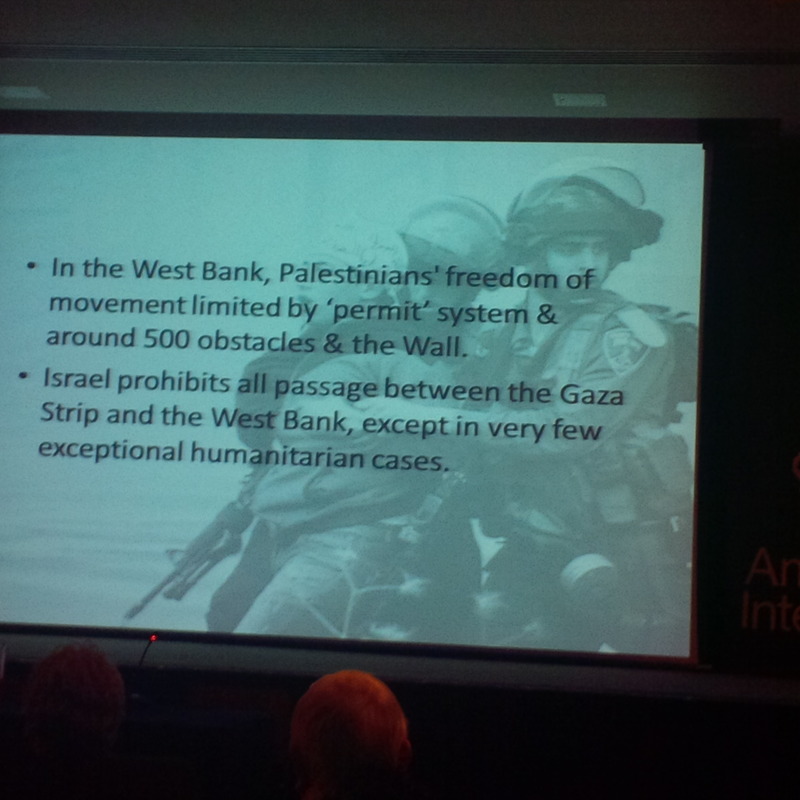 There was an apparent attempt by the Israeli Embassy in London to have the Amnesty event called off. White has his own version of that supposed attempt. We don’t know the Israeli Embassy’s side yet. I had nothing to do with any alleged attempt. Neither did CifWatch. I don’t work for the Israeli Embassy. Hearst knows this. Hearst may have meant generally “the Israel lobby”. Peter Oborne describes “the Israel lobby” as supporters of a foreign power who influence British policy. It’s a nice idea that I can influence British policy, but my solitary vote at the ballot box apart I just can’t. Hearst hasn’t replied to my request for clarification of what he meant by “the folk”. One wouldn’t wish to come to a conclusion without his explanation. Debate and full disclosure are to be encouraged unlike what, sadly, passes for “debate” at Amnesty. Unless I hear from Hearst his use of “the folk” will remain a complete mystery. White and Hearst in discussion at Amnesty last night. 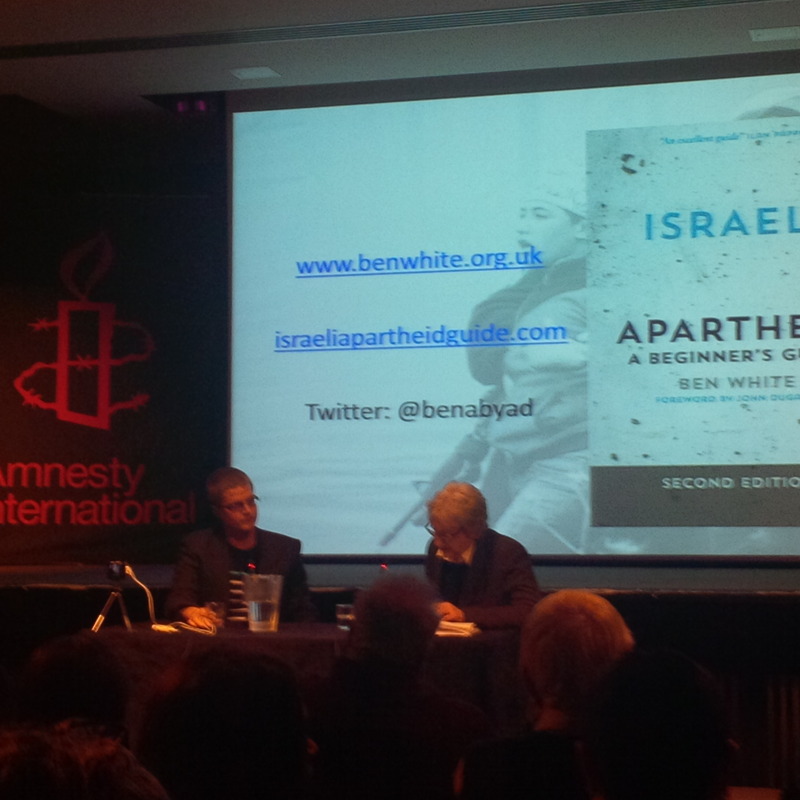 Last night (shabbat) I was at Amnesty International’s London HQ for the launch of Ben White’s updated Israeli Apartheid: A Beginner’s Guide. The event was chaired by David Hearst, former chief foreign leader writer of The Guardian. After White’s talk he had a Q&A with Hearst after which members of the audience were allowed to ask White questions. Well, most of them anyway. I had my arm raised for half hour while Hearst took questions from those sitting around me, before taking questions from the other side of the room. While my arm was still raised Hearst called an end to questions. So, what was I up to? Who am I? Who do I write for? Well, since starting this blog in 2009 I have mainly written for myself. I have occasionally written for the Jerusalem Post, the Jewish News, the Jewish Chronicle and CifWatch, but I never realised writing could get me boycotted. But here’s the point; I have never had any dealings with Hearst. So, how did he know who I was? He was obviously primed but why? I have never been disallowed from asking a question at Amnesty before, although I was once threatened at an Amnesty event by Amnesty Campaign Manager Krystian Benedict, who has since been moved to work on Syria and who was present last night. 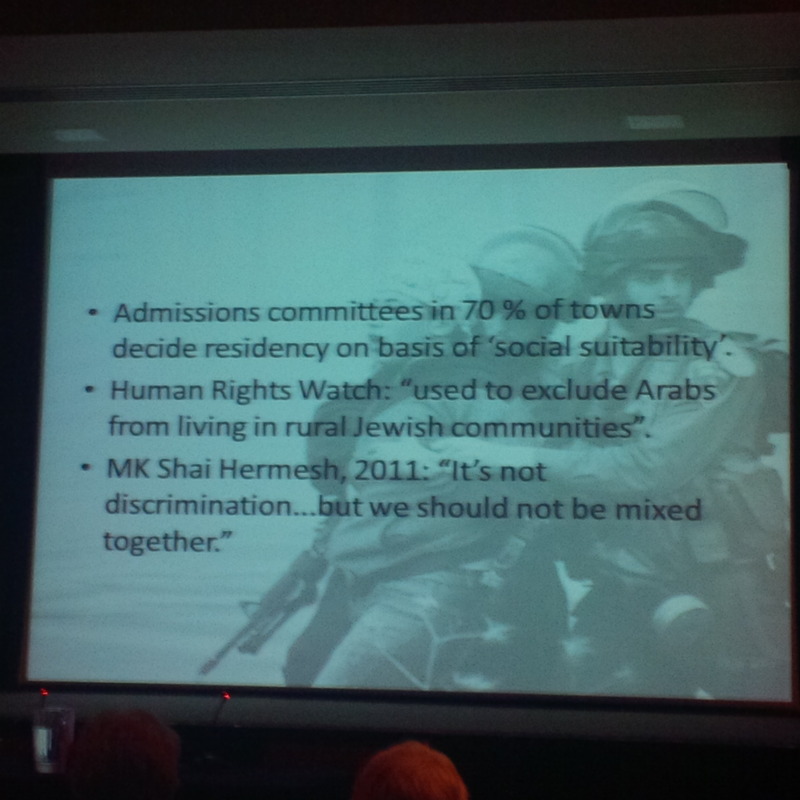 My question to White was going to be simply this: Seeing that White relies heavily on statements by Israeli politicians to paint Israel as racist (see slides below) I wanted to know whether the same could also be said of White particularly after he once stated that (British Jewish author) Howard Jacobson’s face was “another reason to support a boycott of Habima”, the Israeli theatre company. I’m sure White would have batted that away quite easily, wouldn’t he? He reads my blog (he mentions it), so he should feel free to leave an answer below. 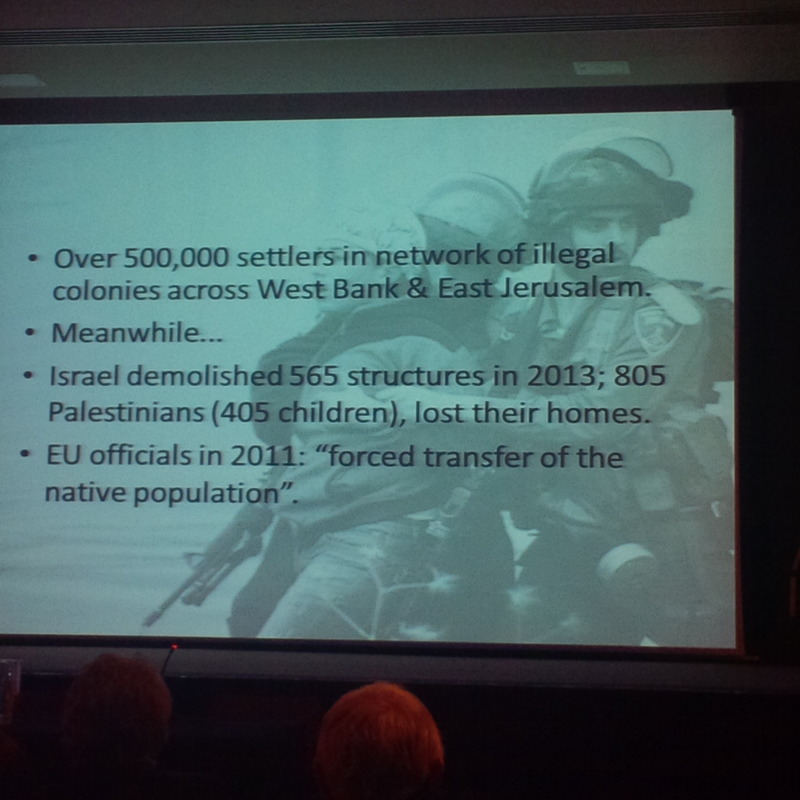 White started his talk addressing the Israeli Embassy’s apparent attempt to stop last night’s event taking place and went on to dedicate the evening to “all those people, including the Palestinians, who have sacrificed so much for liberation”. 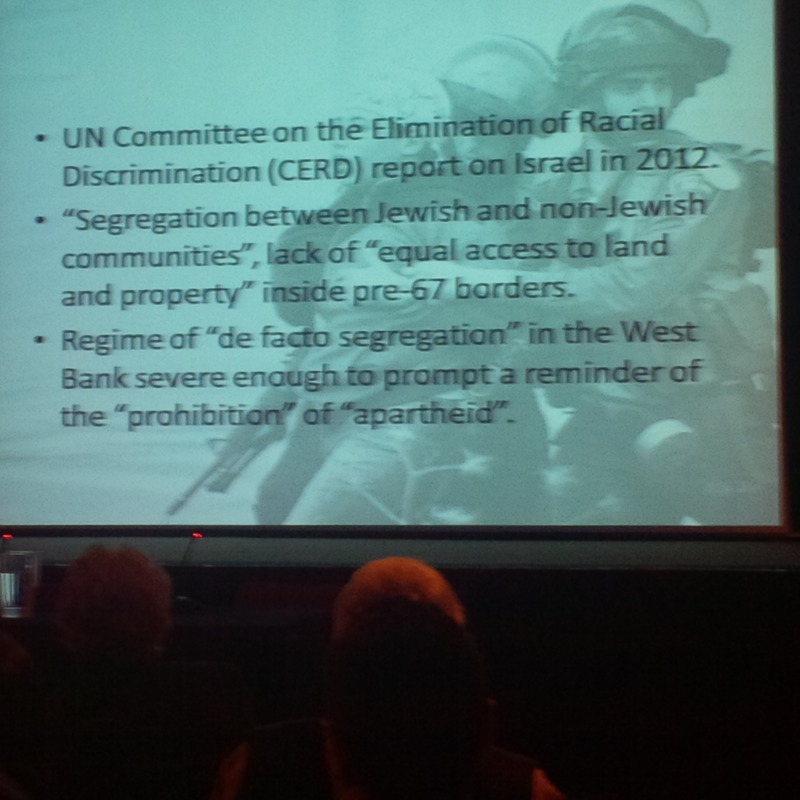 He then proceeded to talk about Israel’s continued “Judaisation”, particularly in the Negev and Galilee, and Israel’s “brutality”, “racism” and “apartheid” (including towards Israel’s own Ethiopian and Mizrahi Jews). White loves nothing more than portraying Israel and Israelis as child killers. 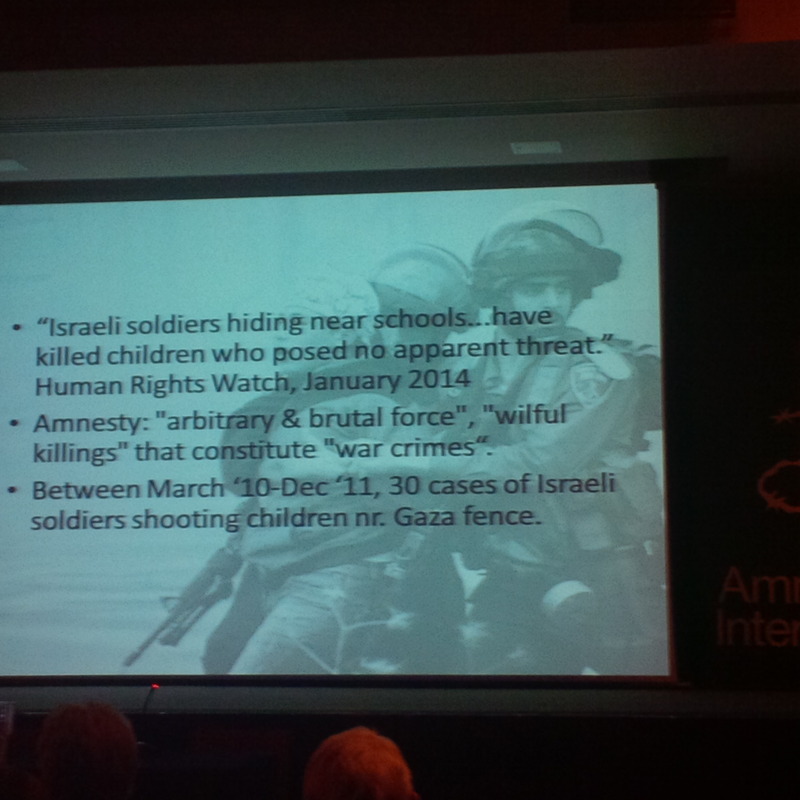 Apparently, Israeli soldiers hide near schools so they can kill Palestinian children (see slides below). 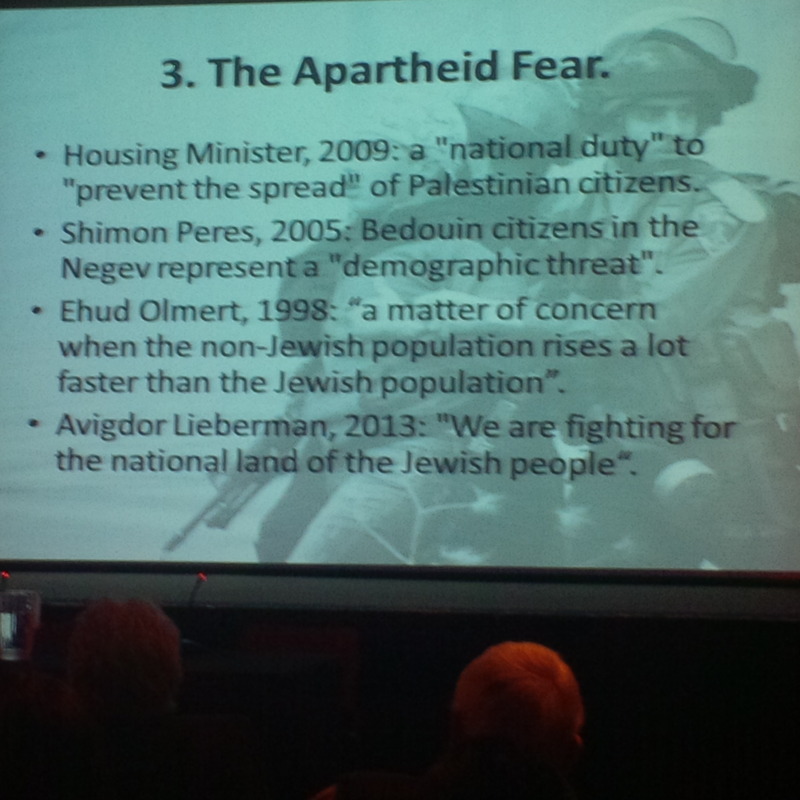 White finished off by telling his love struck audience that “Israel is afraid”. Meanwhile, if last night is anything to go by I’m sure that Middle East Eye, David Hearst’s new website, will be a beacon of democracy and one of many and varied views…..
St James’s Church’s Rector Lucy Winkett’s defence of her church’s installation of a replica of Israel’s security wall in a piece for The Guardian is a legal and moral failure. First the legal side. 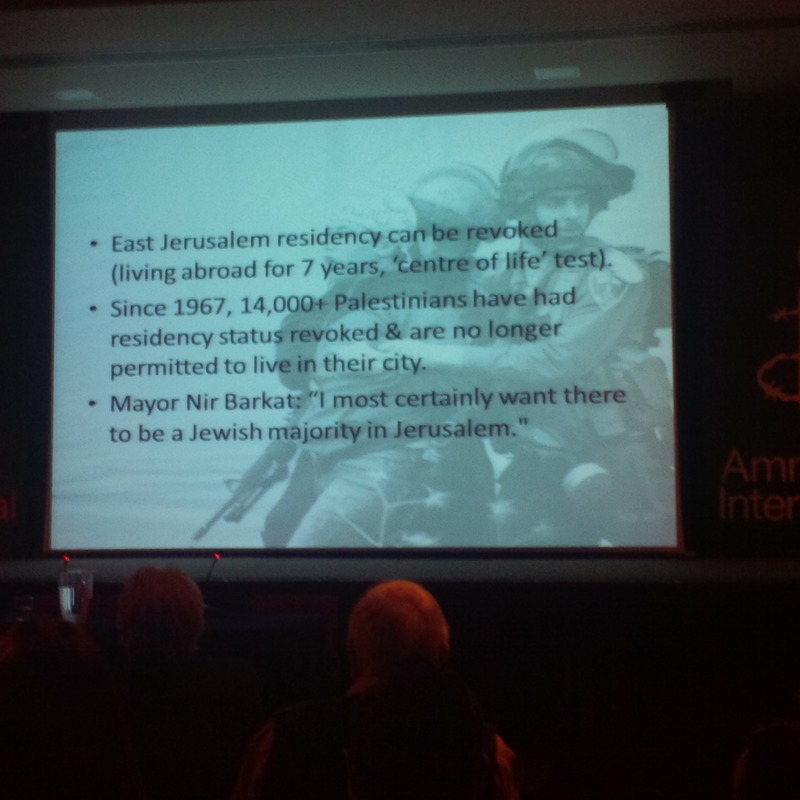 She states that Israel’s wall is “illegal under international law”. It is incredible that so many non-lawyers (and a few actual lawyers) state this with such ease when there is little proper evidence of such “illegality”. But an advisory opinion is just that; advisory and an opinion. It sets no legal precedent. Even if Israel’s wall was “illegal” there is the legal argument of self-defence. If I used illegal means to stop someone killing me I would be guilty of nothing more than self-defence. In parallel with this Israel’s wall has stopped Palestinian suicide bombers killing Israeli civilians. There are legal opinions for and against Israel’s security wall, but for Rector Winkett to declare the wall “illegal under international law” makes a mockery of her claim in The Guardian that “we are not ‘pro’ one side or another”. On the moral side Rector Winkett derides as “irresponsible” those who claim “we are aligning ourselves with those who support the Holocaust, suicide bombings or that we are antisemitic”. 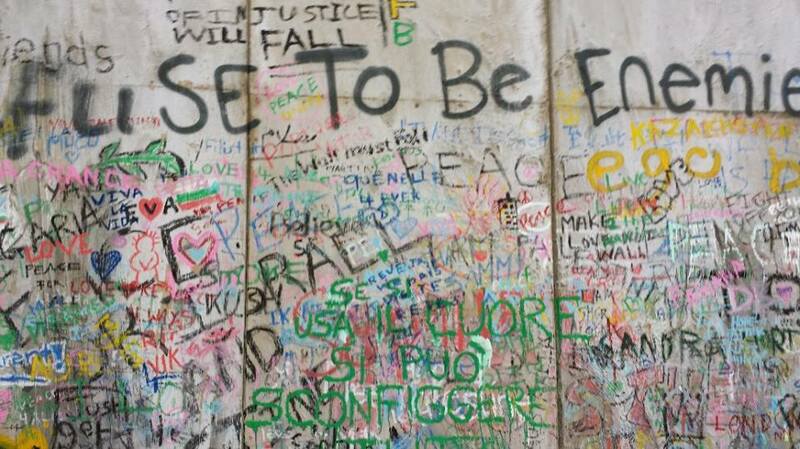 But Rector Winkett’s wish for Israel’s security wall to come down will encourage suicide bombers sent by the likes of Islamist terror group Hamas to resume their murder of Israeli civilians, including those living on the West Bank, which the building of the wall has successfully disrupted. The Hamas Charter specifically calls for the murder of Jews, so, yes, Hamas does support the Holocaust, suicide bombings and is blatantly antisemitic. And then there are the organisations that St James’s Church has expressly aligned itself with for Bethlehem Unwrapped. Rector Winkett writes that St James’s is supporting “a peaceful Palestinian principle known as ‘beautiful resistance’; expressed in theatres, music projects…”. Meanwhile, recent news footage shows Interpal’s primary trustee Essam Mustafa with Hamas leader Ismail Haniyeh. And War On Want and the Israeli Committee Against House Demolitions are part of the Boycott, Divestment and Sanctions movement, a movement that campaigns for Israel’s destruction. Rector Winkett writes in her Guardian piece that all viewpoints are listened to without exception and that visitors have been allowed to write a prayer or message of peace on the wall and that anything offensive has been immediately removed. She also writes that most conversations have been respectful. Rector Winkett also writes that people have written “this wall saves lives”. However, this was subsequently changed to “this wall enslaves lives”. Bethlehem Unwrapped is not a respectful project however much Rector Winkett is trying to convince us. It mocks Israel’s valid attempts to keep both Israelis and Palestinians alive. Palestinians cannot now be sent as suicide bombers by Hamas. And it fails to recognise even the possibility that the main problem for Bethlehem’s Christians is not the security wall at all but intimidation by Hamas similar to that carried out by Islamists elsewhere. Moreover, St James’s Church’s Bethlehem Unwrapped festival has attracted antisemites, Holocaust deniers, those campaigning for the destruction of Israel and those who condone violence to that end. This may not have been St James’s Church’s intention but this is what has happened and for this Rector Winkett should apologise to Britain’s Jewish community which is bearing the main brunt of the backlash. The biggest irony is that St James’s Church itself is protected by a security wall; a tall metal fence that contains a locked door. When the door is unlocked it is heavily guarded. Some may call this a checkpoint. St James’s Church is, understandably, protecting itself from anyone harbouring ill feeling towards it and who may be inclined to carry out an atrocity similar to those carried out against Churches in Syria, Iraq, Pakistan, Nigeria and Egypt by militant Islamists. Israel is doing the same. The cowardice of Peter Oborne. Peter Oborne loves the Jewish people. He loves us so much he wants to save us from ourselves. It’s a shame Oborne wasn’t around at any of the previous troubled stages of Jewish history to advise us where we were going so wrong, but we can only breathe a sigh of relief that he has taken an interest in our current predicament. In his recent article for The Daily Telegraph The cowardice at the heart of our relationship with Israel he writes about the “cowardice” of the Conservative Party for not condemning Israel’s settlement policy in stronger terms. He’s concerned the door will soon be closed on the possibility of a two-state solution and that, eventually, Israel will either cease to be Jewish and democratic or will become an apartheid state. Alarm bells start ringing when someone critical of Israeli policy then co-opts the “the Jewish people”. Are all “the Jewish people” really responsible for “this looming disaster”? Israel is a democracy and British Jews do not have a vote. And it’s not British Jews who have Hamas to their south and Hezbollah to their north. It’s a fact that there are far more non-Jewish supporters of Israel in the world, and thank goodness when considering the tiny Jewish world population. So why don’t Cowper-Coles and Oborne think non-Jewish supporters of Israel require such “help”? Their patronising attitude towards Jews brings to mind Lord Andrew Phillips of Sudbury’s quip that “the Jews aren’t lacking in intelligence”. Oborne finishes his article by claiming that “Mr Cameron does not want to go down in history as the man upon whose watch all hope of a two-state solution died”. Oborne ignores the fact that the two-state solution died in 1937 when the Arabs rejected 80% of British Mandate Palestine, in 1948 when the Arabs rejected 45% of British Mandate Palestine and 2000 when the Palestinians rejected 22% of, what was, British Mandate Palestine. Oborne’s allegation that Israel could eventually either cease to be Jewish and democratic or become an apartheid state bears no relation to reality when one looks at the demographics on the ground. A study by Bar Ilan University proves that should Israel ever decide to annex the West Bank then the 1.41 million West Bank Palestinians would, when added to Israel’s existing Arab population, still leave Israel a Jewish majority and democratic state. Oborne slams David Cameron for devoting just 64 words to the settlement issue at the recent Conservative Friends of Israel lunch. Oborne thinks “This is cowardice”. But Oborne doesn’t criticise Hamas and even blames Israel for the recent conflict. Again Oborne ignores the hundreds of rockets fired into Israel from Gaza before Israel assassinated Hamas’ Ahmed Jabari. And Oborne refuses to differentiate between Palestinian terrorists and civilians who were killed, but just repeats the mantra that “the number of Palestinian deaths vastly exceeded those on the Israeli side”. Oborne ignores Hamas treatment of its own people in forcing them to become human shields. Hamas imports tens of thousands of rockets into Gaza but cannot build even one bomb shelter for the people it was elected by to govern. Oborne also criticises Britain for not backing the recent Palestinian bid for enhanced statehood at the UN. It is morally reprehensible that Britain only abstained. How could a civilised country like Britain refuse to vote against enhanced statehood when considering that the Hamas Charter calls for the murder of Jews? Oborne sets out to investigate financial transactions between Conservative Friends of Israel (CFI) and the Conservative Party and to investigate the influence of pro-Israel lobbyists like CFI, BICOM, Zionist Federation, Jewish Leadership Council and the Board of Deputies of British Jews. A not insubstantial part was dedicated to CiFWatch, which monitors anti-Semitism in The Guardian and its Comment is Free website. 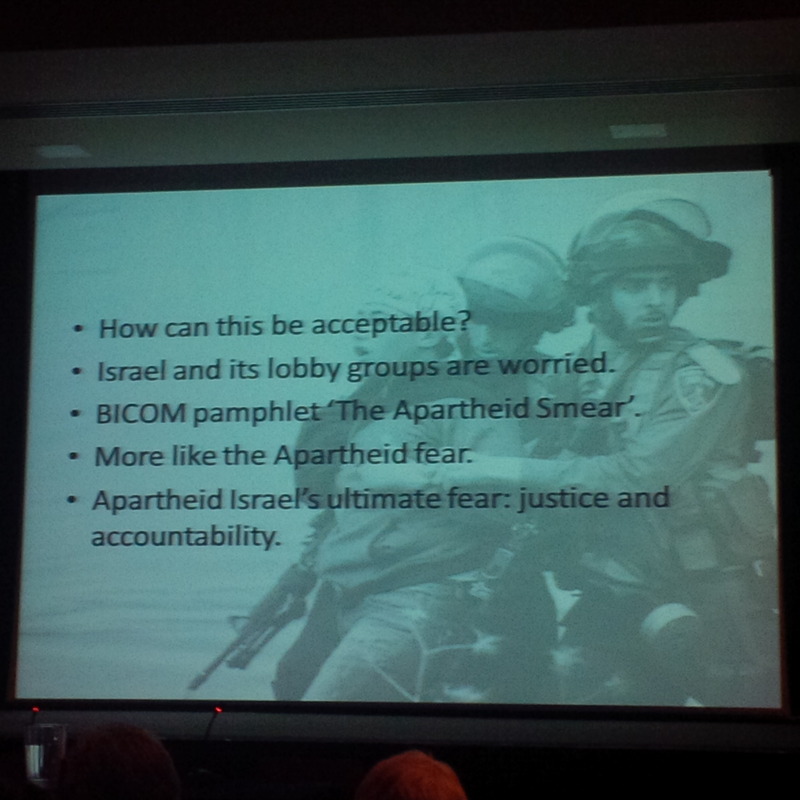 Oborne investigated the claim that accusations of anti-Semitism by pro-Israel lobby groups are being used to silence criticism of Israeli policy. He put to Alan Rusbridger, The Guardian’s editor, an accusation by CiFWatch that the Comment is Free comments’ thread “is full of vile anti-Semitic sentiments”. But since 2009 CiFWatch has proved time and again that some Guardian articles are anti-Semitic. Chris Elliot, the Guardian’s Readers’ Editor, has admitted as much. A recent cartoon by The Guardian’s Steve Bell seemed to employ the anti-Semitic trope that Jews control the world. Elliot admitted that Bell’s cartoon could be considered anti-Semitic. So, Oborne found the pro-Israel lobbies in Britain guilty of nothing more than…..doing their jobs effectively. 1. Why it summarily executes alleged Palestinian collaborators and drags their bodies through the streets? 2. 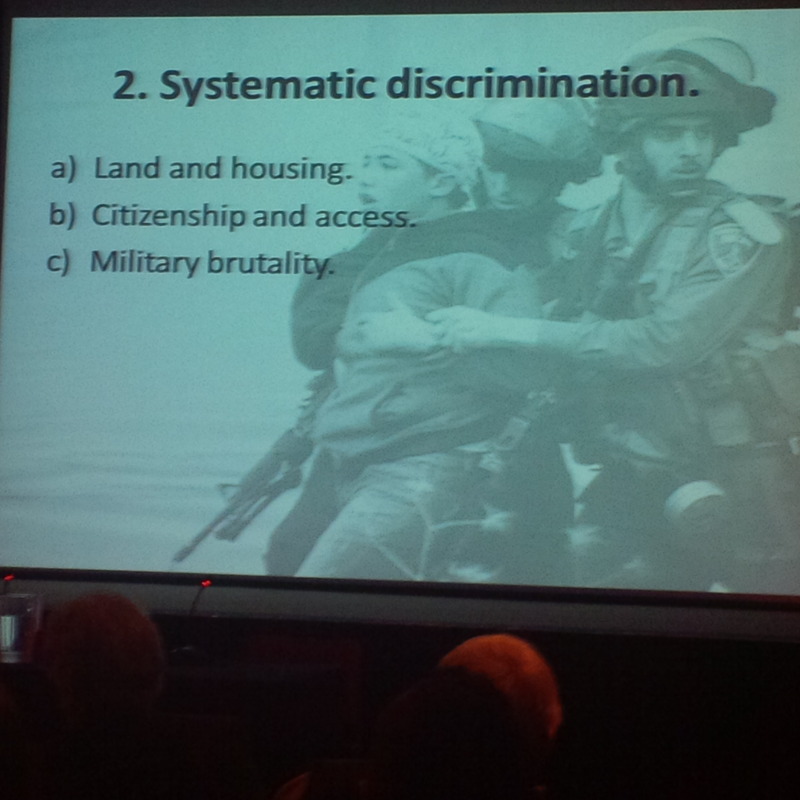 Why it oppresses Palestinian women, gays and political dissidents? 3. Why it doesn’t build any bomb shelters for its people? 4. Why its Charter calls for the murder of all Jews? But we know he won’t go and ask such questions and that makes Oborne the only coward around here.